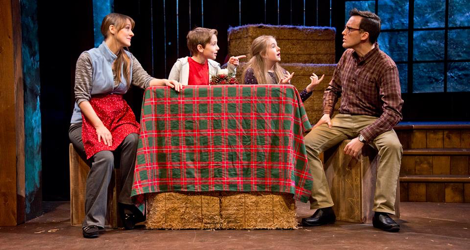 Theatre Orangeville is currently presenting the world premiere of the new holiday family musical The Last Christmas Turkey. The book is by Dan Needles, the author of the seven beloved plays about Walt Wingfield and the music and lyrics are by Clive VanderBurgh, a producer, director and composer for children’s programming at TVO and CBC. The result is a delightful entertainment aimed equally at children and adults much like a Wingfield story only seen from the point of view of children and animals with frequent tuneful interludes of song and dance. After a lovely carol by VanderBurgh, which deserves to become a holiday standard, Needles presents us with a frame within which the main action unfolds. Nancy (Leah Oster) and her younger brother Braden (Justin Stadnyk) are trying to clean out the attic of the family home now that their parents have sold the house and moved into a rest home. The process naturally stirs up memories, particularly of one special Christmas Eve when they were children and thought they could understand the language of the animals. The rest of the musical until near the end becomes a flashback to that Christmas time long ago. The children’s father (Stadnyk) has lost his job and moved the family from the city to a more affordable place in a village in Ontario’s farming country. The children’s mother (Oster), has to take on two part-time jobs to keep the family going until their father finds a new job. Young Nancy (Kyla Johanis) and Braden (Liam MacDonald) can’t even expect to get any Christmas presents even though young Braden would love to have a dog. The children happen to wander past the neighbouring barn of a turkey farmer and notice that it is suddenly empty except for one lone turkey (Trevor Patt). Feeling sorry for the bewildered bird, the children decide to adopt it as their pet and name it Tom. They hide it and feed it in their own barn where Tom gets to know the barn’s other animal inhabitants. There’s Cleo the cat (Jill Agopsowicz), who speaks in a Russian accent and recalls the past when she was a princess before “the Revolution” after which she fell on the hard times of the present. There’s Spartacus the owl (Debbie Collins), who contrary to cliché, is not wise but rather dim-witted with short-term memory loss ever since she flew headlong into a truck one night. And finally there’s Petunia the skunk (Ken James Stewart), a criminal from upstate New York who has sought sanctuary across the border in Canada. The main problem, as the children discover, is that Tom was not abandoned. He was deliberately left behind since he is supposed to be the main attraction at the church’s Christmas Turkey Supper. Though the children now feel guilty that they have “stolen from God” as they put it, they also can’t stomach the idea of having their new pet eaten. Meanwhile, the angry farmer Horace (also Ken James Stewart) launches a search along with his bloodhound to find the turkey and the thieves. The show overflows with a wide range of humour from satires of family relations, to interspecies relations to town and church politics. But the show also does not avoid satire of current events. The four animals in the barn realize that in one way or another they are all refugees, while Horace mentions that he thinks someone should build a wall to keep refugees out of the country. Horace also thinks crime is attributable to welfare loafers and layabouts and sings an entire song about how kids had to be tough in his day and couldn’t afford the delicate sensibilities of the youth of today (i.e. the 1960s). Director David Nairn’s cast is exemplary with most in double roles. The most remarkable performances come from the two child actors who play Nancy and Braden. Kyla Johanis and Liam MacDonald are absolutely at home on stage and light it up whenever they appear. They are natural actors with strong singing voices and dancing abilities and completely hold their own with the adult actors. I’m certain that other children in the audience seeing Johanis and MacDonald will be inspired to try act, singing and dancing themselves. Leah Oster and Justin Stadnyk are a sympathetic pair as the older sister and brother going through the painful task of cleaning out their own pasts from their parents’ attic. When the two play the young Nancy and Braden’s parents, there is more tension in the air. Stadnyk’s general irritability as the father stems from his being unemployed while Oster as the mother is worn out from her two jobs but still manages to be the peacemaker between the father and their boisterous children. Oster’s fine, operetta-like soprano is most impressive in the show’s initial carol where she is the featured soloist. Dan Needles’s conceit is that the animals only make animal noises when humans are around but speak when left to themselves. It’s a tribute to Trevor Patt’s acting abilities as Tom that he finds so much variety of expression in his “gobble gobble” when the kids are with him from joy to surprise to despair. 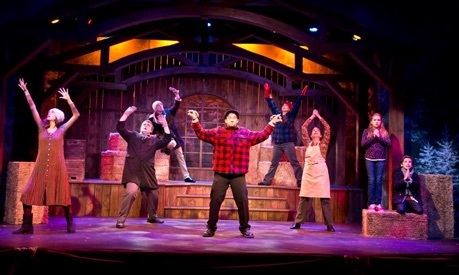 He has an especially fine sining voice and despite being rather hefty(he does play a 25-pound turkey, after all), he is amazing light on his feet and can even do a forward worm across the stage. Ken James Stewart plays characters with totally opposite personalities. As Petunia the skunk he is all worldly and cool and speaks with a Noo Yawk accent. As Horace the farmer he is jumpy and hot-headed and speaks in a string rural Ontarian accent. Stewart is also adept as a puppeteer since he so well manipulates Horace’s companion bloodhound and effectively works as a ventriloquist since he makes the dog’s vocalizations appear to come directly from the puppet sniffing along the ground. The show’s prime comedian is Debbie Collins as the Spartacus the owl. Given the huge number of animal puns in the show I’m inclined to say she’s a real hoot. Even through her owl mask she projects Spartacus’s dazed look and she makes the poor creature’s inability to remember anything from one moment to the next very funny. Collins’s other role is as Milly the local shopkeeper who knows not to inquire too closely about why young Braden is buying huge bags of sunflower seeds and whose level-headedness stands in contrast to Horace’s prejudice and anger. As Cleo the cat, Jill Agopsowicz is suitably flexible and feline in her movements and easily conveys the natural superiority that seems so much a part of cats’ personalities. All four actors make an excellent quartet both as actors and singers, with the three barn animals each having a special ability, as in fairy tales that comes in handy when the children go missing. Cleo has her sense of smell, Spartacus her keen eyesight and Petunia his secret weapon. One of the highlights of Jenee Gowing’s choreography is the lively tap dance quartet she gives Tom and his new barnyard friends. Beckie Morris’s set of a pitched ceiling with crossbeams allows it to serve as either a human dwelling or a barn with hay-bales that can be turned about to become furniture. Vandy Simpson’s costumes for the animals are clever in suggesting the type of each animal without unnecessary detail. Cleo wears a hooded unitard with ears and a tail and Tom white pants, a stuffed baggy shirt, a light cape with scalloped edges and a hood with a red under-strap to suggest wattles. David Nairn’s fluid direction means there is constant movement on stage. Nairn is also willing to make theatrical jokes that result from having the “animal” on stage be so much larger than the children. At one point young Braden is asked to carry Tom out of the way. Well, clearly young Liam MacDonald is not going to be able to pick up hefty Trevor Patt, so after giving MacDonald a few tries at it, Nairn has Patt carry MacDonald off stage. VanderBurgh’s music and lyrics cover a wide range from the warm Christmas carols that begin and end the show, to Sondheimian patter between the adults, to a kiddie song when the children complain about their father, to dancercise music to help Tom lose weight to the rousing gospel number that ends Act 1. John Hughes is the redoubtable pianist and percussionist. With the doubling of its nine-member cast, its one-person orchestra, its exciting seasonal story and wealth of humour, The Last Christmas Turkey should be the kind of holiday musical that amateur and professional groups across the country would love to perform. Needles has aimed his story directly at family audiences with as much to please adults as their children. Given the strong positive impression the show made at its world premiere, it’s clear, to imitate Needles’s puns, that The Last Christmas Turkey really has legs. Photos: (from top) Leah Oster, Liam MacDonald, Kyla Johanis and Justin Stadnyk; Jill Agopsowicz, Trevor Patt, Justin Stadnyk, Ken james Stewart, Leah Oster, Debbie Collins, Kyla Johanis and Liam MacDonald. ©2017 Theatre Orangeville.